The shifting of welding consumables manufacturing facilities to regions such as South East Asia is expected to create demand for welding consumables in those areas. Welding consumables manufacturers are targeting the setting-up of new units to enhance their market share by supplying welding consumables across the globe. Delivering welding consumables at lower prices and launching new welding consumable products to cater the growing demands of the customers is a major concern among the suppliers of welding consumables. Arc welding for manufacturing welding consumables is expected to be the dominant segment over the forecast period due to its beneficial parameters and successful combination with new automation techniques that alleviate the shortage of skilled welders and improve weld deposition rates. 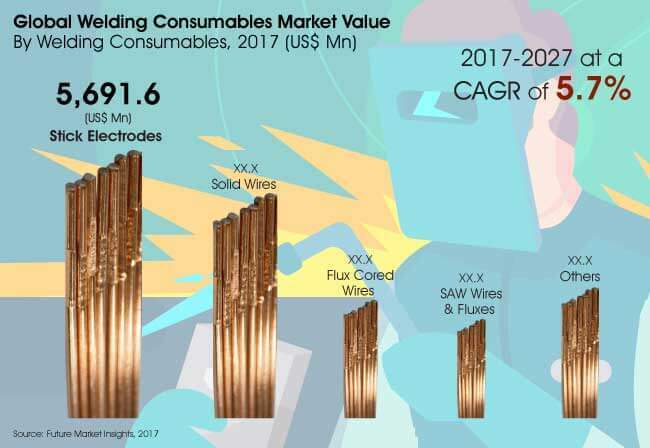 Flux cored wires is estimated to be an attractive welding consumables segment by 2027 owing to its high productivity and lower welding costs. Asia Pacific is foreseen to witness high demand in the upcoming years owing to the availability of cheaper manufacturing facilities of welding consumables. Companies from North America and European countries are planning to shift their production facilities of welding consumables to this region. In the MEA, growth in the construction industry and upcoming projects are expected to create significant demand for welding consumables as well as encourage the development of efficient welding consumables. The material of the production of welding consumables must possess characteristics such as deep penetration, low spattering and high deposition rates. In addition, innovations and automation in welding consumables and equipment on the basis of technique also provides a competitive edge to market players. Over the next few years, the demand for welding consumables is expected to increase for repair and maintenance-related work. Industries such as energy, automotive & transportation, construction, shipbuilding, metal fabrication and processing are major industries that constantly require welding consumables and equipment for repair & maintenance purposes. The rapid growth of end-use industries, such as building & construction, automotive & transportation and manufacturing & steel, is expected to drive the welding consumables market in APEJ and MEA over the forecast period. Moreover, new infrastructural & transportation projects, economic growth in Romania and significant growth in the U.S. underground construction industry are among factors expected to provide traction to the global welding consumables market. Asia Pacific is projected to remain a dominant welding consumables market due to a large number of vehicles and the growing sales of cars in this region. On the other hand, the replacement of the aging ship fleet in Japan is estimated to be a prime factor responsible for growth in the demand for welding consumables in the country. In July 2017, the company announced that it has completely acquired Air Liquide Welding, a subsidiary of Air Liquide. This will enable the company to capitalise on the growth opportunities in Europe. In August 2016, the company acquired Specialised Welding Products (SWP), a Melbourne, Australia-based provider of welding consumables, fabrication, maintenance and repair services for alloy & wear resistant products used in mining and energy sector applications. In October 2016, the company inaugurated a second air-separation plant and extended the pipeline in the Port of Antwerp, Belgium, thus increasing its production capacity of liquid welding consumables. In October 2016, the company commenced the production of a new hydrogen plant in Peru to improve the production volume and act as a major supplier of welding consumables for Repsol S.A. In April 2017, the company commenced operations in its newly built welding consumables plant in Guangdong Province, South China to enhance its production capacity and supply base. In addition, it started a new manufacturing plant in the Chongqing City of China to further strengthen its supply chain and market share of industrial gases in the country. In January 2017, the company announced the expansion of its welding consumables manufacturing unit in Ohio, U.S. by setting up a new liquefier by 2018 to increase its nitrogen-producing capacity to cater to the demands of customers. The major regions aiding the growth of the global welding consumables market are Asia Pacific excluding Japan and Europe, owing to a significant degree of installed base and the potential demand for welding consumables from the end-use sectors in the region. The rising demand for welding consumables from major end-use industries, such as chemicals, iron & steel, oil & gas and energy, has forced these industries to install welding consumable plants at their own sites to maintain cost-effective and reliable supply. The welding consumable market is expected to be largely driven by the ongoing growth across industry vertical that require air products in the developing economies of South East Asia Pacific, Middle East & Africa and China. As a result, global players in the welding consumables market are focusing on strategic mergers and acquisitions to expand their global footprint in these regions. Key welding consumables market participants are supplying a wide range of customisable on-site production solutions to meet the diverse needs of several industries with regards to volume and purity. New investments in these regions are expected to create several opportunities for the welding consumables market players as these regions will require high amounts of gases, and the requirement of reliable and cheap gas supply will create demand for welding consumables. Moreover, growth in sectors, such as food & beverages and healthcare, is expected to boost the demand for welding consumables, especially in the developing parts of the globe. On the basis of welding consumables, the global welding consumable market can be segmented into stick electrodes, solid wires, flux cored wires, SAW wires & fluxes and others. The stick electrodes segment accounted for a 40.5% value share in 2016, and is expected to expand at a significant CAGR over the forecast period. On the basis of welding consumables technique, the global welding consumable market can be segmented into arc welding, resistance welding, oxy-fuel welding, laser-beam welding, ultrasonic welding and others. The arc welding segment of the welding consumables market accounted for a 41.9% value share in 2016 and is expected to expand at a CAGR of 5.6% over the forecast period. On the basis of the applications of welding consumables, the global welding consumables market can be segmented into automotive & transportation, building & construction, marine applications and others. The building & construction segment accounted for a 16.8% value share in 2016 and is expected to expand at a CAGR of 5.9% over the forecast period due to an increase in building and construction activities in emerging countries such as China and India. By region, Asia Pacific excluding Japan (APEJ) exhibits higher market attractiveness of welding consumables followed by Western Europe. Overall, the global welding consumables market is expected to grow at a CAGR of 5.7% in terms of value by the end of the forecast period. The major participants involved in the production and sales of welding consumables include Praxair, Inc.; Voestalpine AG; The Linde Group; Air Products and Chemicals, Inc.; EWM AG; Air Liquide S.A. and MESSER Group GmbH. This FMI study offers a ten-year analysis and forecast of the global welding consumables market between 2017 and 2027. The study considers 2016 as the base year with welding consumables market values estimated for the year 2016 and a forecast developed for the duration of 2017 to 2027. Compound Average Growth Rate (CAGR) is represented from 2016 to 2026. The study covers various perspectives of the welding consumables market, including market dynamics, value chain, pricing analysis, competition analysis, regional and segmental growth comparison and macro-economic & industry growth analysis, along with segment-level projections in a comprehensive manner. As per the findings of the study and the perspectives of industry participants, the global welding consumables market is projected to grow at a CAGR of 5.7% between 2016 and 2026 in terms of value. A large fleet of merchant vessels sailing through international waters are mandated to install advanced technology-integrated radar systems, which is leading to sustained growth opportunities for the welding consumables market. The Future Market Insights report on the welding consumables market carefully analyses the market at a global and regional level through market segmentation on the basis of key parameters such as welding techniques, welding consumables and applications. The primary objective of this report is to offer key insights on welding consumables market updates, competition positioning, current trends, welding consumables market potential, growth rates and other relevant information & statistics in a suitable manner to the readers or various stakeholders of the welding consumables market. The global welding consumables market report begins with a market introduction, defining the market taxonomy and product definitions regarding the global welding consumables market assessment. In the report, Flux and filler metals have been considered as welding consumables. These welding consumables melt while joining two metals to help form a strong joint and protect molten weld from atmospheric containments In the next section, the report describes a background of the welding consumables market development that covers macro-economic factors, industry factors, product life stage & associated stages, forecast factors, regional weighted average pricing analysis, value chain overview covering approximate margins, an indicative list of stakeholders involved in each stage and an assessment of the installed base & replacement rate of welding consumables during the base year that is considered for the study. The next section of the welding consumables market report discusses market dynamics, such as drivers (supply and demand side), restraints and trends, which impact the growth of the welding consumables market at a global level. Market opportunities or potential for welding consumables manufacturers have been presented in the subsequent section of the same chapter. This section also includes the impact assessment of the dynamics of the global welding consumables market at a qualitative level based on the analysis of facts and insights. Subsequent sections of the global welding consumables report provide value (US$ Mn) projections for the welding consumables market on the basis of the aforementioned segments at a global level. The global market values represented in these sections have been agglomerated by collecting data and information at a regional level. The market information, along with key facts and insights, covers unique analysis frameworks such as absolute $ opportunity analysis, year-on-year growth trend comparison, market share and attractiveness analysis for each of the sub-types covered in each segment. The next section of the welding consumables market report presents a summarised view of the global welding consumables market based on seven prominent regions considered in the study. This section includes the regional market position, growth potential, trends and welding consumables market attractiveness analysis for each of these regions. The welding consumables market analysis sections covers regional trends, weighted average pricing analysis and market projections for each segment, including Y-o-Y growth trends, market share analysis, market attractiveness and incremental $ opportunity assessment. These sections analyse the degree to which the global drivers are influencing the welding consumables market in each region. All the above sections evaluate the present welding consumables market scenario and growth prospects in the global welding consumables market, while the forecast presented in these sections assess the market size in terms of volume and value. To offer an accurate forecast, we started by sizing the current welding consumables market, which forms the basis of how the global welding consumables market is expected to develop in the future. Given the characteristics of the welding consumables market, we have triangulated the outcome of three different types of analysis based on primary research, secondary research and our own analysis. However, forecasting the welding consumables market in terms of various heat-pump segments and regions is more a matter of quantifying expectations and identifying opportunities rather than rationalising them after the completion of the forecast exercise. In addition, it is imperative to note that, in an ever-fluctuating global economy, we not only conduct forecasts in terms of CAGR, but also analyse the welding consumables market on the basis of key parameters, such as Year-on-Year (Y-o-Y) growth, to understand the predictability of the welding consumables market and identify the right opportunities available. As previously highlighted, the welding consumables market is split into a number of sub-segments. All the welding consumables sub-segments, in terms of product type and region, have been analysed on the basis of Basis Point Share (BPS) to understand each individual segment’s relative contribution to the market growth. This detailed level of information is important for the identification of various key trends witnessed in the welding consumables market. Another key feature of this report is the analysis of all the key segments in the welding consumables market, sub-segments and the regional adoption & revenue forecast in terms of absolute dollar opportunity. This is traditionally overlooked while forecasting the market, however, the absolute dollar opportunity is critical in assessing the level of opportunity that a provider can look to achieve, as well as to identify the potential resources from a sales and delivery perspective in the welding consumables market. To understand the key market segments in terms of the growth and installation of welding consumables across concerned regions, Future Market Insights has developed the welding consumables market attractiveness index, which will help providers identify real market opportunities. In the final section of the report, a competitive landscape of the welding consumables market is included to provide report audiences a dashboard view categorised on the basis of providers present in the value chain, their presence in the welding consumables market and key differentiating factors & strategies. The primary category of providers covered in the report includes welding consumables manufacturers. This section is primarily designed to provide clients an objective and detailed comparative assessment of the key providers specific to a market segment in the value chain of the welding consumables market. Report audiences can gain segment-specific vendor insights to identify and evaluate key competitors on the basis of the in-depth assessment of their capabilities and success in the welding consumables market. Detailed profiles of the welding consumables providers are also included in the scope of the report to evaluate their long-term and short-term strategies, key offerings and recent developments in the welding consumables market. Key competitors covered in the welding co0nsumable market report include The Lincoln Electric Company; Colfax Corporation; Illinois Tool Works Inc.; Hyundai Welding Co., Ltd.; Praxair, Inc.; Voestalpine AG; The Linde Group; Air Products and Chemicals, Inc.; EWM AG; Air Liquide S.A. and MESSER Group GmbH.